Xiaomi may have debuted as an online-focused brand by selling phones only via online without many physical stores in place. Apparently, the time for change has come. The company realized that offline stores still have a better impact on sales compared to buying online. Having physical flagship stores are somehow necessary for growth in some markets. And the offline market is an untapped market for Xiaomi. So, the firm finally decided to penetrate the offline market, and they did it big time starting in India. Although the Chinese brand already opened numerous stores in the country over the past two years, they’ve outdone it this time. On October 29, Xiaomi simultaneously opened more than 500 Mi Stores in 14 states across India. The number itself is unbelievable and it did capture the world’s attention. In case you don’t know, Apple brand only has 198 stores, more or less, in the US. On November 20, Guinness World Record formally acknowledged this mind-blowing feat and decided to give Xiaomi the World Record for Most Stores Opened Simultaneously. 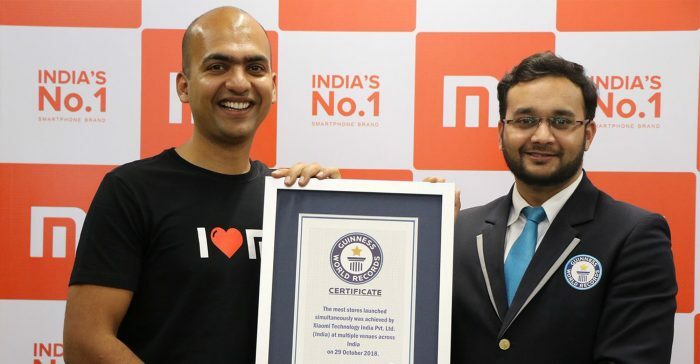 The director of Xiaomi India, Manu Kumar Jain, shared this great news to the world via Twitter. Moreover, he also shared that the company is planning to open over 5,000 stores by the end of 2019 and creating 15,000 jobs in the process. Offline expansion is necessary for India since most of its rural areas are still having trouble in connectivity. These stores can also provide aid for inquiring customers. Allowing them to go hands-on with the products and understand how the device works. This is the second major achievement the brand has since its lifetime. In 2017, industry consultants such as Canalys, IDC and Strategy Analytics included Xiaomi as one of the top five smartphone brands in terms of shipment. The company shipped 21.2 million units worldwide that represent 59% increase compared to 2016. This is considered a major milestone for a smartphone brand knowing that it existed for less than a decade. Xiaomi was established in 2010 and only went public in Hong Kong this year. The company also exceeded the revenue goal of RMB 100 billion in just a span of seven years. This revenue goal took Apple 20 years, Facebook for 12 years, and Google for 9 years. In just a span of 8 years, the brand is now present in 74 countries worldwide. Most of the major highlights of the company happened in 2018. During the first quarter of 2018, Xiaomi already had approximately 190 million monthly active users on its own in-house Android-based operating system MIUI. On the same month, over 1.4 million users have more than five connected Xiaomi products and that count still exclude smartphones and laptops. The secret behind is probably the company’s goal to offer high-end specs at rock-bottom prices. The company proved that premium specs and durability can be attained via low manufacturing cost and placing only about 1 or 2 percent profit margin on each product. The brand believes that aiming for large volumes with small profits will result in big profits in the long run. However, that belief was proven otherwise since it didn’t take long for the company to earn crazy income.